Samuel Bagshaw was born in Sneinton, Notts in about 1885, the son of Samuel & Elizabeth Bagshaw. In 1904, he married Mary Ann Riley and, it appears. they lived at various addresses, including Breaston and Long Eaton, Derbyshire and Radford, Nottingham where four children were born2. In April 1911, they were living at Main Road, Chilwell, Notts but appear to have moved again to live at 44 Oxford Terrace, Windsor Street, Beeston3. In 1911, Samuel was working as a self-employed window cleaner. The Bantam Battalions were the brainchild of Albert Bigland MP, Chairman of Birkenhed City Recruiting Committee when he suggested that all able bodied men of below the qualifying height of 5’ 3" should be formed. By mid February 1915, a unit to be known as the 15th (Service) Battalion Sherwood Foresters was formed in Nottingham by the Mayor and a committee, as an all "Bantam" battalion and joined the 105th Brigade 35th Division which was part of the No 6 Recruiting District. Samuel Bagshaw was one of the first to enlist when newly formed 15th Battalion Sherwood Foresters started recruiting in February 1915. In June 1915, the 15th Battalion found themselves at Masham in Yorkshire where they became part of the 105th Brigade 35th all bantam division. After training at various camps in England the Division was sent to France in January 1916. In August 1917, approval was given early in the month for a major undertaking involving a raid on Gillemont Farm and the capture of a commanding position known as "The Knoll" and instruction was given to the 15th Battalion, as part of the 105th Brigade, to undertake this task. After extensive artillery fire the battalion advanced at 0400 hrs on the 19th August. When the barrage lifted and the battalion reached the enemy position they found the artillery had done their job and hand-to-hand fighting continued until the Germans were driven back. The assault was over in some fifteen minutes and by 0540 hrs the companies returned with their wounded and a few prisoners. Three of the wounded were at the hands of the Royal Flying Corps who machined gunned them down unaware they were firing at their own.4. Private Bagshaw died about a week later, as a result of wounds received during this action and enemy shellfire. It was just before the battalion was due to be relieved by the 14th Gloucester Regiment. He is now buried in Tincourt New British Cemetery. Tincourt New British Cemetery - Tincourt is a village about 7 kilometres east of Peronne and Tincourt New British Cemetery is on the west side of the village, just off the D199. Barleux French Military Cemetery No 2, between Barleux and Belloy-en-Santerre, containing the graves of two soldiers of the 1st Loyal North Lancs who fell in February, 1917. Howitzer Wood Cemetery, Clere-Sur-Somme,a French cemetery in the Bois des Ourages, containing the graves of three soldiers from the United Kingdom and one from Australia. Le Verguier German Cemetery, near the Church, containing 292 German graves and those of five soldiers from the United Kingdom who fell in April, 1918. Longavesnes British Cemetery, on the West side of that village, containing the graves of 19 soldiers from the United Kingdom and three American soldiers, who fell in September and October, 1918. Magny-La-Fosse Churchyard Extension, made by an Advanced Dressing Station in October, 1918, and containing the graves of seven soldiers from the United Kingdom and one from Australia and three men of the Chinese Labour Corps. Manancourt Churchyard, which was closed to civil burials in 1865 but was used by both sides in the War. It contained the graves of ten soldiers from the United Kingdom and one from South Africa. Ramicourt Communal Cemetery Extension, made by the Germans and taken over in October, 1918, by the British. It contained the graves of ten soldiers from Australia and one from the United Kingdom. Suzanne French Military Cemetery No 1, near the Chateau of Suzanne, containing the graves of one soldier from the United Kingdom, one from Australia, 255 French and one German. 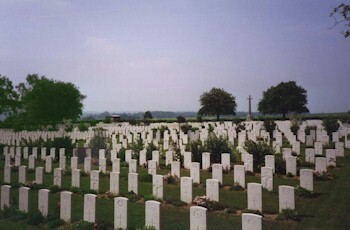 Vraignes Churchyard, in which three soldiers from the United Kingdom were buried by the enemy in March and April, 1918. Vraignes Communal German Cemetery Extension in which one British and 117 German soldiers were buried5. 3This address is given for his widow in the Commonwealth War Graves Commission records. His parents are there described as "of Nottingham"
4The account of the battle is based on "The Blast of War" - a History of Nottingham’s Bantams, 15th (Service) Battalion Sherwood Foresters, 1915-1919 by Maurice Bacon and David Langley. (Published by Sherwood Press Nottingham Ltd, 1986).